Located in the Southern Alps, Alpes de Haute Provence (04), you have an appointment with Val d'Allos. An alpine resort with three parts ... two stations and a village! This is what makes the originality of the Val d'Allos. The first two are two complementary resorts while the third is a traditional mountain village. - Val d'Allos, La Foux, including the ski resort is common with Praloup "Espace Lumiere"
- Val d'Allos-Seignus, family village resort Both benefit from label "Famille Plus Montagne". The Val d'Allos, is at the edge of Mercantour National park, in the southern French Alps and Provence. Val d'Allos Haut Verdon is above all a place for hikers, with more than 1000 km of trails and an unforgettable landscape. Discover Val d'Allos' scenery, its mountains, protected nature, peaks with breathtaking views… You will no doubt see chamois or colorful alpine flowers. Val d'Allos, in the southern Alps, a beautiful mountain for holidays with three distinctive locations. La Foux, a high mountain atmosphere in the Southern Alps in France, Espace Lumière which also includes the Pra-Loup ski area will enchant skilled and athletic skiers it joins by the Agneliers valley. Built at an altitude of 1800 meters, its all-wood architecture is unique ; there are no concrete blocks or skyscrapers here, only chalets and small residences decorated with wood, offering a friendly atmosphere. It is an ideal venue for families and friends to appreciate the dry, vivifying climate and friendly environment. Le Seignus, is a family ski area, situated in the south of France. A point of convergence between traditional mountain and new activities, it is a perfect family place. It has a variety of slopes, easy to challenging. It has earned its “village/ski resort” status thanks to cabins linking it with Val d'Allos - the village. 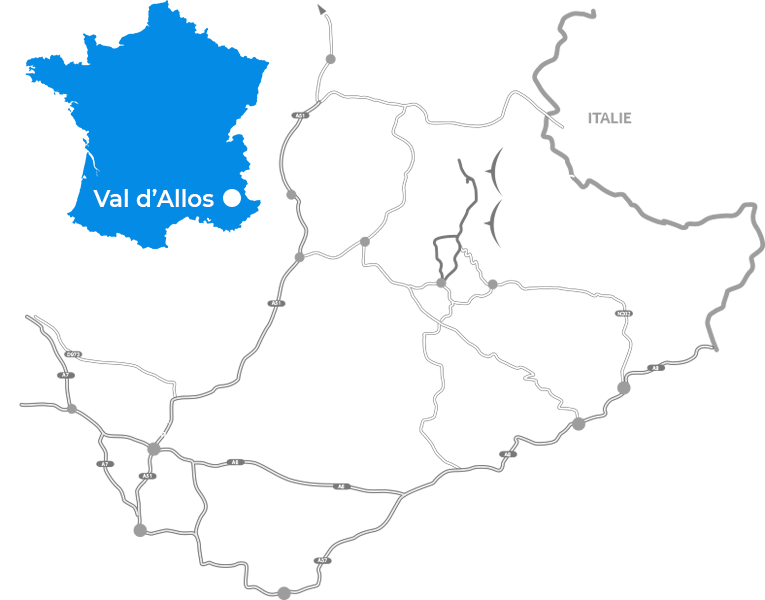 Allos is located 2km down from Val d'Allos - le Seignus french ski resort and 9 km down from Val d'Allos-la Foux. A typical mountain village in the southern alps. Here you can enjoy your stay and profit by snow shoes rambles. It is located in the south of France nearby Mercantour National park, which is a protected area.